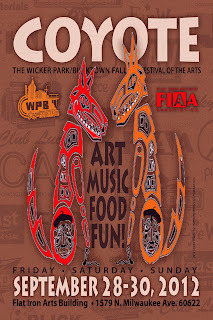 We were invited to play an acoustic duo set as part of the Coyote Arts Fest in Wicker Park last night. We ended up doing a “passionate” set in a really cool artist’s studio. It had a nice old wood floor, with a tin ceiling, and the acoustics were great. There was a small, friendly, and enthusiastic audience. It’s great when people actually sit and listen. And it’s great when you bring it. We brought it last night. Yes, you need songs, and you need to be tight, and you need to get the sound right.